Economical, general purpose, Black Vinyl Tape 3" or 4" x 36 Yards. Use for color coding, bundling and safety marking. Great for Use on Insulated Bundle Tubes and Trunk Lines. 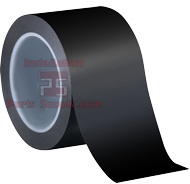 Also, Help keep costly accidents down with This 3" x 36 Yard or 4" x 36 Yard Black Vinyl Tape, it can be used as safety Tape.